F-22 Demo Pilot "Loco" Lopez making serious clouds at the recently completed AirPower Over Hamptons Roads, VA.
Nice portrait of AK 131 on the tarmac at the 2018 LA County Airshow, Lancaster, CA. They sure are, aren't they? Makes for some nice wallpaper too, if so inclined. 2017 Gulf Coast Salute Airshow, Panama City, FL. TY 026 with WWII era P-51B. Two F-22s from the 95th EFS above the skies of Syria. A little love to the Edwards jets. 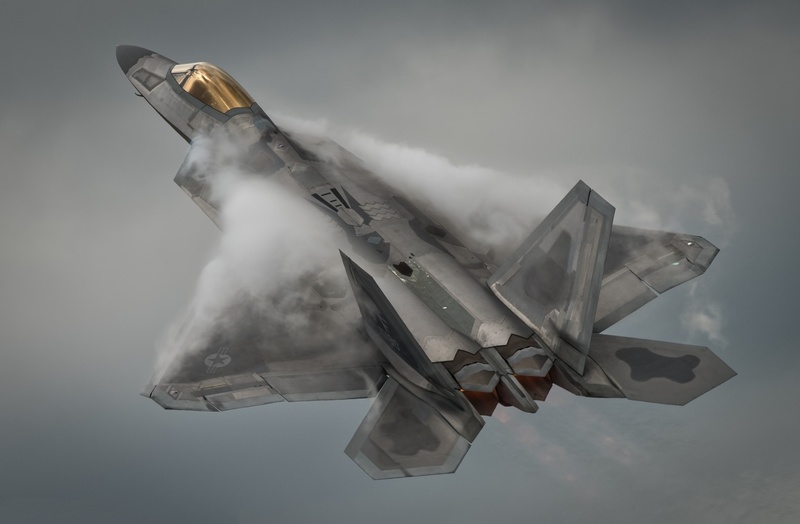 Despite how they look, at various periods of time, the Edwards jets can be considered the most advanced F-22s flying. FF 182 & 189 recent "tour" of Virginia on June 14. From the Hampton show posted above, "VaporFest"
Some 95th FS jets during Tyndall's recently completed Phase II deployment exercise held 14 June. Loco is one cool dude! ...there were 2 different WVR (Within Visual Range) dogfights: the first one was a 1 vs 2 between an F-22 and 2x Eurofighters from Ala 14 based at Albacete; the second one involved the other Raptor and one F-18 Hornet from Ala 12 (122 Squadron) – actually this second aerial engagement was slated to be a 1 vs 2 scenario but one of the Hornets aborted.